The Brits have been preparing for some time the after Marco Pierre White cuisine. Not that there is a british style but we can certainly say that the emerging chefs are pro-locavore and that they are sourcing the best products of the island of Albion. In the very cosmopolitan London, the influences of young chefs are many, which give them a unique culinary personality. I thought I’d come back later with another English chef, but circumstances have changed the schedule, so I complete a “Londoner trilogy” with the chef Junya Yamasaki. I know that many chefs already know very well Junya and Koya restaurant, I have heard only “good things” about him and his “small dishes” marked by simplicity and creativity. It was during his art studies in Paris he began to cook, and it was under the teaching of Mr. Nomoto (Udon master) he learns the art of Udon noodle in Paris. Junya Yamasaki is a self-taught, but he made an “internship” with two of the most famous chefs of the moment, Magnus Nilsson (Fäviken Magasinet) and Dan Hunter (Royal Mail Hotel). 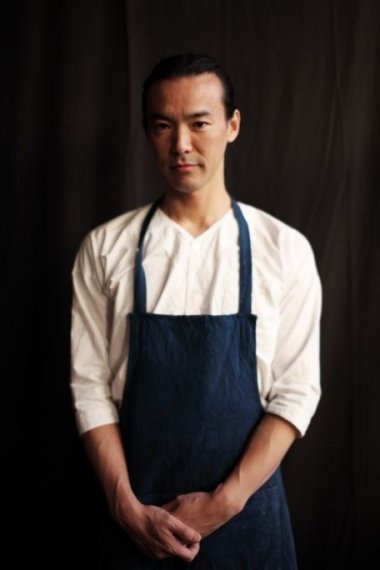 In 2010, he opened with partners, Koya (London), a casual restaurant specializing in Udon noodle but quickly became a “must-go-to” for the “daily small plates” of chef Yamasaki. But thanks to this interview, I discovered a creative chef in symbiosis with its products and very influenced by his japanese roots (Kansaï) and philosophy Shyojin Ryori. His “cuisine” is unlike any chef that I interviewed, except maybe 1-2 chef(s) from Australia/NZeland. A “cuisine” closer to the artistic improvisation and to the instinct of the chef, completely inspired by the products of certain suppliers. It may be a coincidence, but in the way, I think at chef Bertrand Grébaut (Septime). Just to illustrate, here are a few recent titles of his dishes: Nuka Fermented & Grilled Mackerel with Shiso Daïkon/Steamed Turnip in Dashi with Ramson Oil/Tofu, Chicory, Dandelion & Mustard Salad/Grilled & Hay Smoked Char. Definitely a chef to follow for a long time! JYamasaki– Our speciality is Udon noodle, but we also play a lot with daily changing/special black board/small plates Menu. My “cuisine” is honest/natural/simple/minimal. Stylistically close to the popular and everyday home cooking, philosophically influenced by Zen and Shyojin Ryori. Seasonal ingredients are essential, then we try to find our products locally, therefore some of our food become strange for the Japaneses, but familiar to the Europeans, that could be a challenge for us and exciting for the customers. 2-(Scoffier) Where did you learn to make the udon noodles/dishes? JYamasaki– In Paris, under the Udon master Mr. Nomoto at famous Udon noodle restaurant called “Kunitoraya”. 3-(Scoffier) Do you have a flavour or taste from your childhood that is again memorable? JYamasaki– I’m from Kansaï, West side of Japan, which is famous for light seasoning. I love the tastes of fish caught and grilled by the river and I love the smell and taste of ripe tomato just picked from tomato plants. 4-(Scoffier) Do you have a particular foods (or products) that you often use in your recipes? JYamasaki– I like pickling the part of vegetable we normally throw away like turnip green and use it for seasoning. I also love the English game in general which I perceive like a true luxury. 5-(Scoffier) Do you have a mentor (chefs or anybody else) that inspires you in your career? JYamasaki– Fergus Henderson, Rosanjin Kitaoji as chef and some Zen monks (past and present) in Japan. 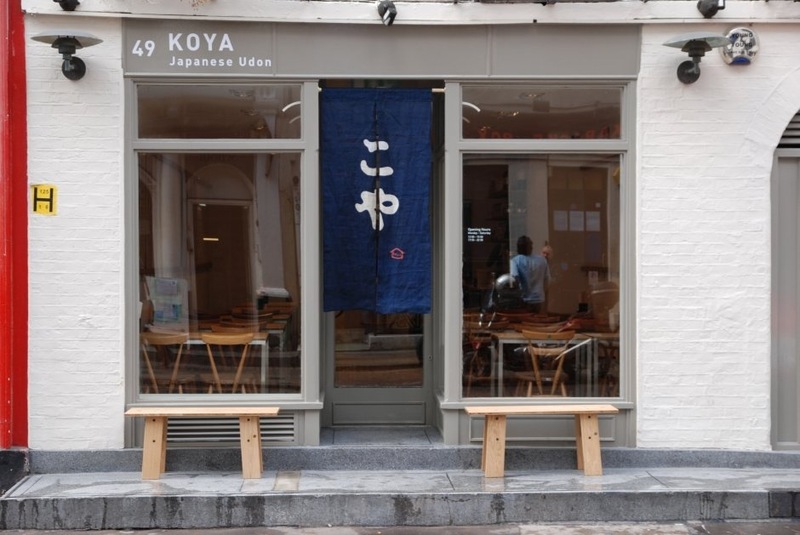 6-(Scoffier) Koya specializes in the classic udon dishes but you have a great reputation for your “daily small plates”? How do you develop (creative process) your daily menu? JYamasaki– Very simple. First, I get fresh and local seasonal ingredients and then wonder what can I do with these ingredients today. It is the fresh ingredients that dictates our “small plates menu” everyday. I try to be open to all cooking methods but I also try to listen to the “voice of nature” and to the precious gifts and tellings of great predecessors and precious thinkers. 7-(Scoffier) Initially it was only udon restaurant, how daily specials meals arrived in the menu? JYamasaki– True, but we had this in our mind before we opened the restaurant. We knew we have to enjoy cooking, not just do the same food to feed everyday, and this is the best way to do.The more we do, the more we have learned things, that is actually so exciting. That’s also why I want to do a “daily changing menu”. The literal meaning of Shyojin Ryori ( Zen Monk’s food ) is “make effort to progress everyday”. I learned enormous amount of stuff in past three years, from both Japanese and European cooking, on the history of food and, it’s funny, I had to learn a lot about my own culture and heritage. Never thought about Zen aspect for example. 8-(Scoffier) Is this one of the aims to offer kaiseki-style meals in the future? JYamasaki– It doesn’t have an aim to offer kaiseki, though kaiseki has a root to Zen and Shojin Ryori. It is just fascinating “cuisine”, vegan but full of understanding of food, creativity and the life. 9-(Scoffier) Can you give us a detailed recipe (Signature dish or other) that is characterized the cuisine of Junya Yamasaki? 10-(Scoffier) What are your goals (ambitions) as chef and for Koya? JYamasaki– Continue feeding the people with nice food of course, and at the same time I always want to learn more about the meaning and esthetic of eating. In KOYA, we have been serving “Braised Pork Belly with Apple Cider” from the day one, and it has been the biggest seller as a small plate menu. It is so addictive that I call it Pork Brownie. This version is the recipe that I came up with when I discovered fantastic local dark beers and honey in Faviken during a few weeks stage there. I cooked it as a staff meal on my last day together with “Rain Deer Dashi” Udon. And ever since, I put on our special black board menu sometimes. I even did with chocolate stout and orange as an half joke, but it was seriously good! 1) Cut the belly pork into big brick size, or buy the bricks of pork belly. Sear them all around in hot frying pan. 2) Boil them with medium strong heat in water for about 1,5 hours (this is to render the fat and leave only collagen in belly). Let them cool down till the room temperature in the boiled water and keep in the fridge. The water will be set like jelly and the belly meat will be kept in it easily for a week if it is properly refridgerated. 3) Take the amount of belly blocks as you want to cook from it. In Koya, we cook quite a lot everyday, but at home you can accommodate with the size of casserole that you have. Cut them into chunk of cubs (3-4 cm) and layout in your casserole. Do not lay one on top of the other. 4) Cover the belly with the braising sauce mix with some ginger and whole small onions, then braised with medium heat till the sauce gets reduced and get the silky texture. It will usually take around 2 to 3 hours. 5) Serve with hot mustard.